So why am I writing about it and why does it matter to you? Well, if you’re reading this blog then you’re interested in losing weight. You’re also interested enough to consider using hypnosis to help you get to your right size. You’ve also decided the gastric band process appeals to you but maybe not surgery. Whatever you decide to do to lose weight realize it will be a journey and will require commitment, dedication, avoiding temptation, and a new way of life. Otherwise you’ll end up with the same results you’ve always got – and you do deserve better. 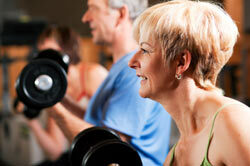 Miss Ernie – as she is affectionately known – didn’t start down her exercise path until she was in her fifties. She gets up at 3am every day and runs 10 miles a day, and then teaches classes and does her own body building exercises. She changed her way of life later in life… and stuck to it. Now, I’m not suggesting you mirror the exact regime that Miss Ernie is doing with 10-miles a day and up at 3am. But mirror her attitude and commitment when setting your weight loss program. Commit to a regime you can keep – don’t set yourself up for failure – but one you can do comfortably. Exercise is important but walking 15/20 minutes a day is fine to start. Choose a healthy diet plan you can stick to – protein and veg with no processed food will get you most of the way there as regards a diet, but do a plan that works for you. When Miss Ernie goes out at 3am to run 10 miles nobody sees her. If she went out at 4am nobody would know – except her. If she did 9 miles instead of 10, nobody would know – except her. Do you think that matters to her? You bet it does! If you skipped your protein and veg lunch and instead slipped out for a KFC lunch by yourself – chance are nobody would know – except you. And you are what matters and not what anybody else thinks. Do a weight loss plan for yourself – not anybody else. Find more information about Weight Loss programs and the Gastric Band Hypnosis clinic here.